Brad Penas of Moorhead, Minn., considered himself lucky enough that he had drawn an elk hunting license for the season, but the fact that he may have bagged a state record on his first hunt for the animal is just starting to sink in. 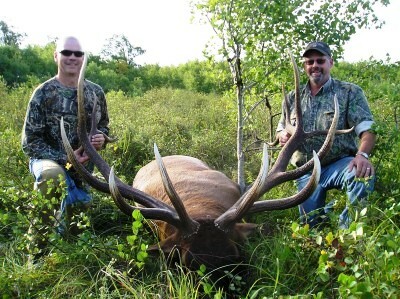 Penas, 45, hunted Minnesota’s famed Kittson County, which produced two of the four largest elk ever found in the state. Elk were reintroduced to Minnesota in the first half of the twentieth century and thrived especially in Kittson County thanks to a land purchase in 1993 by the Nature Conservancy. Prescribed burns and conservation efforts produced wide stretches of grassland and other habitat well-suited to elk, which led to more healthy animals. So it is no surprise that elk hunters value the land so highly, or that licenses are in such high demand in the Midwestern state. Penas, who grew up near Kittson County, met up with old friend Marty Lieberg to prepare for the hunt. Although Penas now serves as a Lieutenant in the Moorhead Police Department further to the south, he is familiar with the area and had hunted there before for deer. Elk were a whole new game for Penas, which is why he requested Lieberg’s help in pursuing the animals. For weeks prior to the season opener, Penas and Lieberg scouted the area. A few friends who work as local outfitters were invaluable in their search, but the hunters’ first week of scouting still ended dismally with no sightings and little to go on. Penas hunkered down and prepared for a long slough. Then, during their second week in the area, he spotted three different bulls. One of them stood out from the rest. The bull was spotted again later on by friends of Penas, at a much closer distance. They confirmed that the elk was monster-sized. On the day of the season opener, Sept. 14, Penas returned to the woods with Lieberg and a Remington Model 700 chambered in .270 Winchester. The wind was working against them, forcing the pair to change up their plans. It was the chance that Penas had been waiting for. With the elk only 70 yards away, he had barely any time to react. What Penas did have, however, was an excellent shot. It was also the right animal, and possibly one for the record books. The next step was getting the elk out of the woods, and since the Nature Conservancy does not allow motorized vehicles on its land, moving the animal was going to be a problem. Penas and Lieberg returned to area with several friends and ended up hauling the bull 70 yards to the private property, where it was loaded onto a trailer for transport. The animal’s size was overwhelming. The elk weighed 820 pounds field-dressed and Penas estimated that it would have weighed over a thousand pounds before. The rack was even more stunning, with a gross green score of 433 and initial net green score of 404 on the Boone and Crockett Club (B&C) typical American elk scale. The scoring was done by the same taxidermist that is now preparing the elk for mounting. Penas says that the results are not yet official, as B&C requires a mandatory 60-day drying period before an official scoring can be conducted. “I think it’s going to be pretty accurate, I’ll probably lose a few points but we’ll see what happens when it dries out,” Penas said. One possible complication is the seventh tine on the rack’s left side, which extends 13 inches from the main beam. Because of this, the elk’s net green score was knocked down to 391. A shoulder mount of a 1,000-pound animal is bound to take up space, and Penas is not sure if there is room for such a beast in his house. 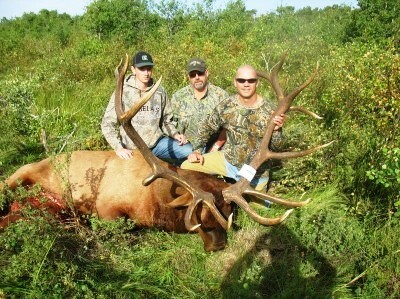 Perhaps positive results in November and a state record will earn the bull a place in the Penas residence. For now, the hunter will just enjoy the memories of a successful first elk hunt.